Harris-Stowe State University’s on-campus housing offers some of the most modern student residence halls in the St. Louis area. Enjoy the luxuries of an apartment with the convenience of living on-campus with suite-style facilities, which include a furnished living room, kitchenette, dining area and private bathrooms. Located on the main campus, the residence halls are just a two-minute walk from the Dr. Henry Givens, Jr. Administration Building, where most classes are held. The residence halls are so much more than a place to eat, sleep and study. Collectively, the residence halls house a dining hall, game room, computer lab, the University Bookstore, the Office of Student Activities, Counseling Services, Health Services, and the dean of Student Affairs. Not only are the members of these offices always ready to assist, but the director of Residential Life and resident assistants are also available to help students with their educational and personal needs. Being a member of Harris-Stowe’s friendly campus community also means having the opportunity to grow through our varied educational, social and service-orientated programs offered throughout the year. 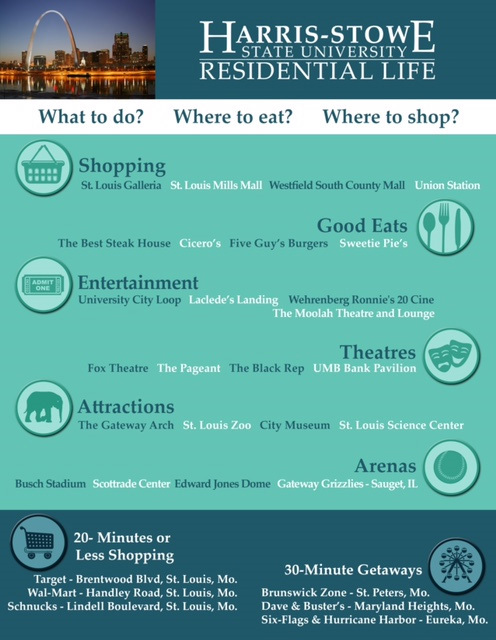 To arrange a tour of these remarkable residence halls, please call (314) 340-5300.